The TSKgel HXL column lines consists of eight columns with different pore sizes, TSKgel G1000HXLthrough TSKgel G7000HXL, and three columns with an extended linear range of the calibration curve, TSKgel GMHXL, TSKgel GMHXL-L and TSKgel MultiporeHXL-M. 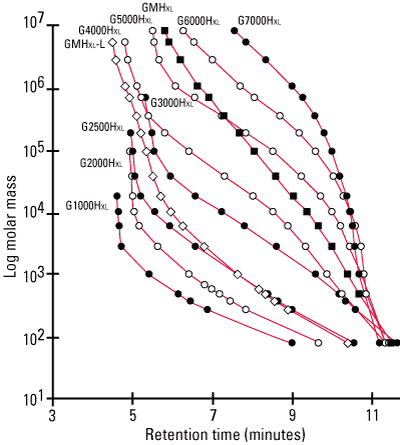 The calibration curves for all TSKgel HXL columns are shown. Maximum operating temperatures for TSKgel HXL columns is 60 °C for G1000HXL, G2000HXL, G2500HXL and G3000HXL, and 80 °C for the remaining columns in the product line. One of the mixed bed columns is available for high temperature analysis up to 140 °C. Limited solvent range. The columns are shipped in THF, which can be exchanged for a limited number of organic solvents (see Table below). TSKgel HXL columns are conventional GPC columns with column dimensions of 7.8 mm ID x 30 cm. Most HPLC systems do not require optimization of extra-column bandbroadening effects when working with conventional GPC columns. Two of the TSKgel HXL columns are mixed bed columns, in which particles with different pore sizes are blended to provide an extended linear calibration curve. The TSKgel MultiporeXL-M column is packed with particles containing a wide range of pore sizes that provide a linear calibration curve. The unique multi-pore approach, pioneered by Tosoh, is a synthetic chemistry answer to the question of how to obtain a column with an extended linear calibration curve, while mixed bed columns represent a mechanical way of obtaining a linear calibration curve. In general, Multipore columns have a smoother, more linear, calibration curve. See the product page for multi-pore technology for the principles behind mixed bed and multi-pore columns. The column shipping solvent limits the types of solvents that can be used with each column type. In case of TSKgel HXL, keep flow rate below <0.5 mL/min during solvent change. Solvent can be changed one way/one time only. All TSKgel HXL analytical columns are shipped containing tetrahydrofuran (THF), except TSKgel GMH-HT columns, which contain o-dichlorobenzene. THF in TSKgel G1000HXL columns cannot be replaced with dichloromethane or dichloroethane.